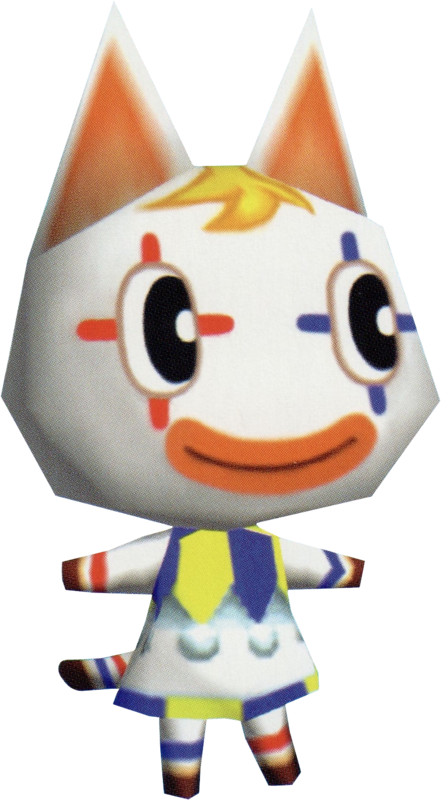 Pierre is a jock cat villager from the Animal Crossing series, appearing only in Doubutsu no Mori e+. Pierre's name, French for Peter, is likely derived from Pierrot, a type of melancholy clown, similar to Pietro, who has a similar design to Pierre. Pierre can only move into town after scanning his e-Reader card, which was exclusively bundled with an official binder for Doubutsu no Mori+ and Doubutsu no Mori e+ e-Reader cards. Pierre is a white cat with mime-like markings on his face, also appearing to have a blonde tuft of hair. He has pale orange inside his ears. He also seems to have a tuft of blonde hair. He has black stripes on his arms and feet. Pierre is a jock villager, despite his appearance resembling a lazy villager. Being a jock, Pierre obsesses with fitness and keeping healthy, while subtly criticizing other villagers. Specifically, this can cause conflict with Snooty and Cranky villagers, the former of which taking the most offense. Modified on March 13, 2019, at 14:31.